ten disgusting old men are prancing about all over what used to be the garden - before the geese and the swans and the cows got at it; and several of them, I notice, are taking inexcusable liberties with the milkmaids. Meanwhile the neighbours are trying to have us evicted. He has a few spaces for beads to be added. 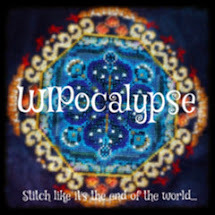 So, sorry to Kerry, I have nothing for Theme-tas-Stitch Opulent October! All that red in the Piper was stitched on the 11th and 12th Days of Christmas earlier this year so I have a nice headstart on that block. 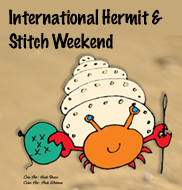 Those of you that have been blogging for a while now may recognise that little fellow as Hermie, the mascot for International Hermit & Stitch Weekend hosted by Joysze of Random Ramblings. 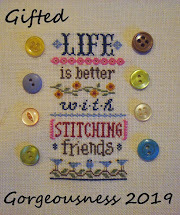 Joysze has not blogged for a while although some people have continued to hermit and stitch alone. Well, she has resurfaced and has been persuaded to revitalise IHSW on Facebook. If you'd like to join us, then just click on Hermie and it will take you to the group. Finally, there's still time to sign up for the Spookiest Hop on the Block - the Trick or Treat Hallowe'en Blog Hop. All you have to do is leave a comment or send me an email. 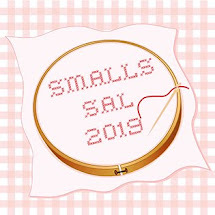 I will send you a letter of the alphabet which you show on your blog on 31st October along with some spooky stitching. We all hop around collecting the letters which will spell out a spooky word. Love the 12 days ...it is wonderful. That fabric is beautiful. Sign me up for the Halloween hop. The 12 Days is just beautiful! Looks like it will be finished before the big day! The 12 days is looking lovely and right on track for completion. Your new block is very pretty! Lovely new start on "Pixie Raven"! 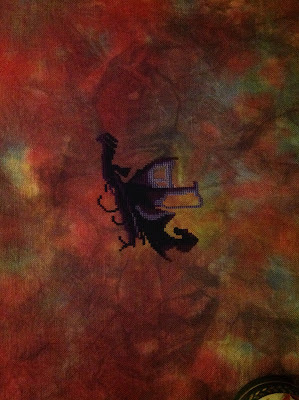 That fabric is fabulous! I think I may have to stir up my dye pots...NO! I will behave! Your 12 Days is stunning Jo. Love your pixie fabric. Your 12 Days is looking more fantastic every time you post - and you're nearly done!!! Love the fabric for the other piece, it's just gorgeous. Lovely progress on this project. Wonderful stitching Jo such a lovely project. 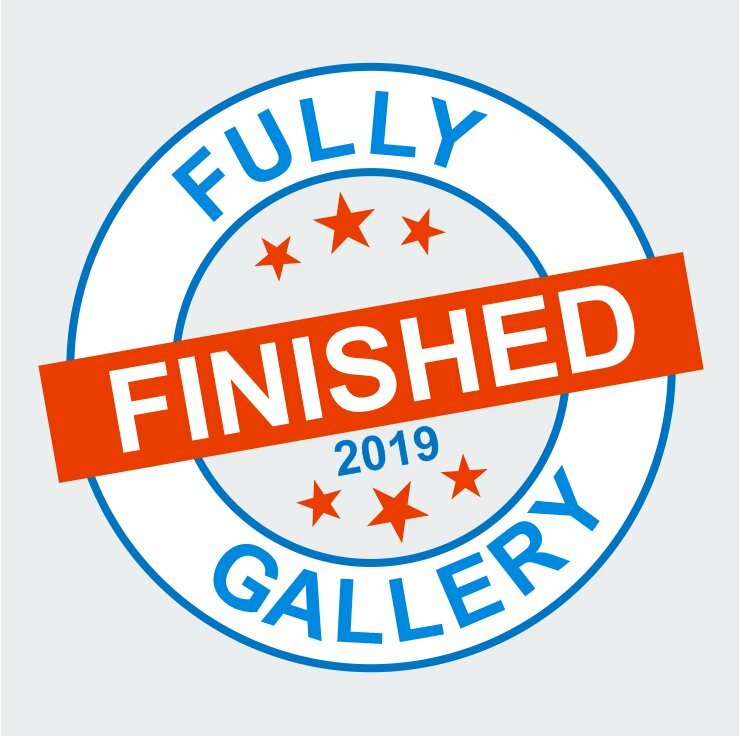 Oh wow, so close to finishing, it looks wonderful! I LOVE the fabric, perfect for the Pixie. Beautiful progress on your stitching. The pixie is just gorgeous indeed on that fabric. 12 days is looking fabulous..... love the ribbons! Gorgeous colours for Pixie, and what a start! Sorry I don’t have any Halloween stitching ..... but I love to see other people’s! I like the 12 Days piece, really lovely and nearly finished. Unusual and bewitching pixie. Oh yes, poor Emma. Lol. But the dancing lord looks gorgeous and very joyful. There are only two empty spaces on your Twelve Days now. And again I wish I had only a little bit of your being so organized, lol. Oh the poor Emily! I do fear for how Edwards courtship will end. Your stitching, on the other hand, does look great!